My passion for cooking actually came while I was in high school, when I was 13 years old. Had an executive chef who used to be a former Walt Disney World chef and he really got me into falling in love with ingredients and falling in love with the food. I love following recipes, I love creating things from recipes, but the real passion came when I was able to create whatever I wanted too. Efficiency and organization is the backbone of any successful operation. Without it, you aren’t going to succeed in what you do. The biggest challenge in running an operation of this size is really just creating efficiency and productivity. The impact of not having the right equipment is extremely visible. Having a dependable product that you rely on, that’s something we look deeply into to make sure we have the right solution to our business needs. This is the biggest hotel I’ve worked at in my career, ya know, and in terms of coverage, it’s really high. That’s where the organization is important. With this particular hotel, everything was sitting on a shelf at one point or another, and if we didn’t have that type of organization and that kind of space utilization with our shelving units, we wouldn’t be able to effectively service our guests. That’s where the Cambro shelving line really helped us in our operation become more efficient. Working with Cambro they actually came in, measured out the room, and made custom pieces to fit the entire room so that I could use the entire scope of the storage area. The problem with wire shelving is you know the rust is probably the biggest thing, you know, you get into operations where you are throwing away a ton of scrap metal and things like that into a trashcan. To have the Camshelving® itself, I’m not throwing anything away. Moving to the Cambro solution, we’ve been able to really maximize our team in getting a much more sterile environment, I would say that everything needs to have a place, and the Cambro shelving really helps provide that solution for us, which creates efficiency back-of-the-house which trickles down to impact our team that’s on the floor working face-to-face with the guests. The Cambro brand is important to me just because of the fact that it just really means quality, um, and durability, and, ya know, Cambro really stands behind their product. I take a lot of pride in what I do, and to see my kitchen running smoothly and efficiently is probably, you know, the one of the most important things for me. Here at the Hilton Anaheim we do have some limitations for walk-in cooler space so the camshelving itself really helped us maximize the space that we do have. 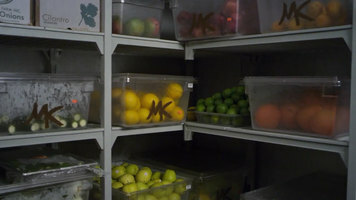 The walk-in cooler itself is a very busy place, very chaotic, that’s why having the Camshelving® itself is very important for our organization just because when they come back here they know exactly where everything is, the way everything is stored, and then they can just go out with it. The shelving unit itself has to be durable in a walk-in cooler, especially a produce box just because of the sheer weight. Before here we had wire shelving in here for quite a while and you could definitely tell over time it just starts to bow right down the middle. The importance of the Camshelving® is that it doesn’t bow; it lasts and is very durable. It’s one of the most sturdiest shelving units I’ve ever worked with. 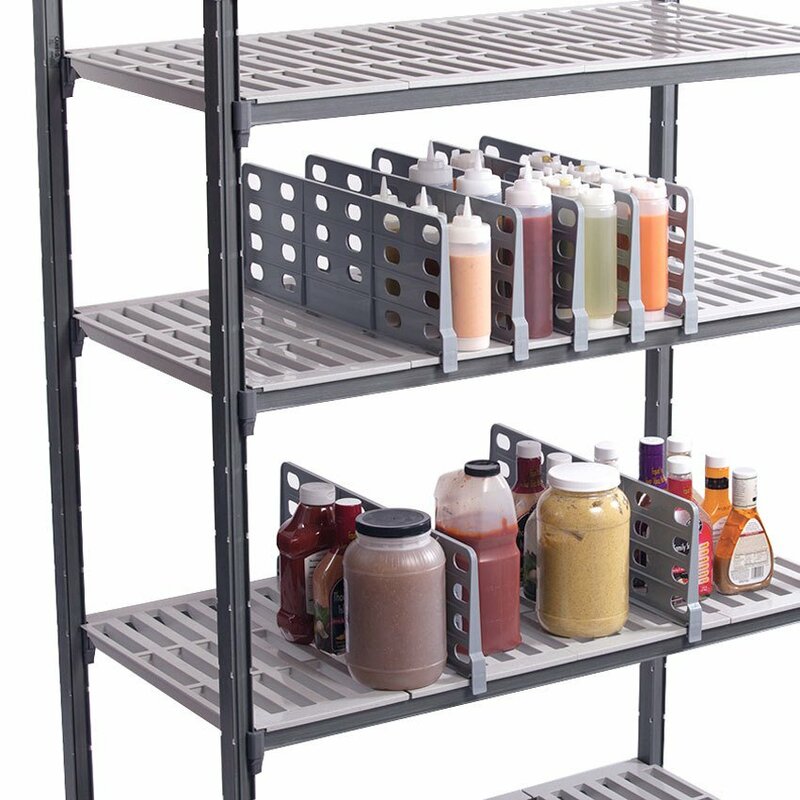 Looking for a durable shelving unit for your foodservice operation? Check out Cambro’s Camshelving® Premium Series! These shelves won’t bow under heavy weight, which makes them long-lasting and reliable. 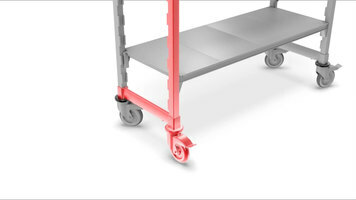 Install a caster on your Cambro Camshelving® unit by first attaching your connector bar to the leg. Place the black bumper on the caster and attach the caster to other side of the connector bar. Use a hammer to secure it. Repeat on all other legs of your unit to make it mobile. Install casters on your Cambro Camshelving® unit by following these simple steps! Once finished, your unit will be mobile and ready for use. Cambro Camshelving® Premium Series: shelf rail assembly. Installing end rails. Slide one end bracket into the dovetail on one side. Hold the other end bracket in one hand and insert the rods. Twist the end bracket and slide it into place in the dovetail. Repeat for the other end. Installing side rails. Insert the end cap into one side bracket. Snap the side bracket onto the traverse at one end of the shelf. Install the other side brackets spaced evenly along the shelf. Slide each rod through the open end of the bracket into the end cap. Insert the other end cap. Repeat on the other side. See your shelf contents stay in place! Shelf rails are a great way to keep the contents on your shelves secure during movement. Watch this video to see how easy it is to install shelf rails on your Cambro Camshelving® Premium series shelves. 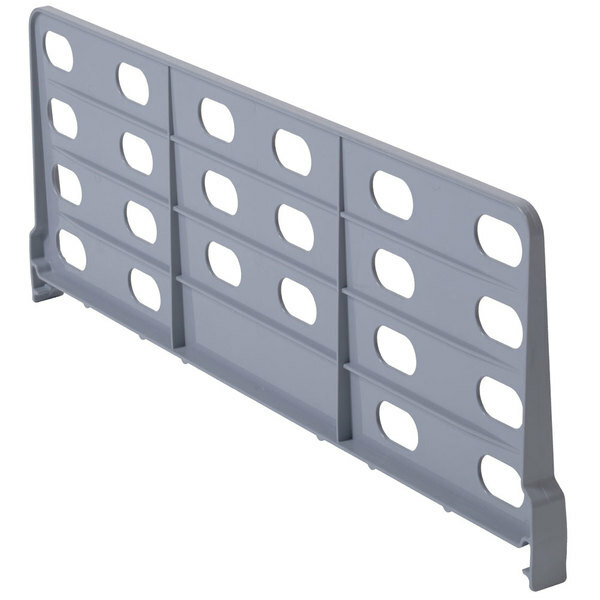 Use this Cambro CSSD188151 gray shelf divider to easily stay organized with smaller items! 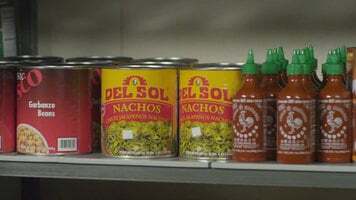 Its 8" height helps contain smaller items like vacuum-sealed produce packages and squeeze bottles so that they stay upright. This divider fits on Camshelving® Premium and Elements series shelving that have an 18" width. It's made from rust-free, high-impact ABS plastic and has vents to allow for proper ventilation in cold rooms and freezer applications.